We offer an business listings for companies conducting business in Broward County. Any business operating in Broward County can submit a listing including contact information and company description, including a link to their website (if they have one). 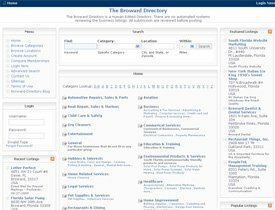 The Broward Directory is a Human Edited Directory. There are no automated systems reviewing the business listings. All submission are reviewed before posting. Advertise your business whether you have a web site or not! It is more important now, to get your website listed in as many available sites possible. Search Engine Marketing is essential to any web based business. We conduct ongoing web based marketing to increase the popularity of this website. Consequently, your business listing becomes more valuable everyday as we forge our ongoing marketing efforts.